Spanish Gazpacho Soup Recipe is delicious cold soup, perfect for spring and summer! The bald chef shows you how to make this classic Spanish dish. The soup is made with organic chicken broth, avocado, and fresh tomatoes. 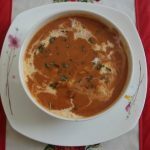 Spanish Gazpacho Soup Recipe is easy to make and has a lot of flavor, healthy, tasty, and low in fat. So if you want to learn how to prepare this soup from Spain watch the video. In a blender add 32 oz of Chicken Broth, 1/2 Hass avocado, 1 Tomato, and one Onion, 1 Teaspoon of cayenne pepper, and 1/2 tablespoons salt. Blend Ingredients for your Gazpacho Soup for 1/2 min. 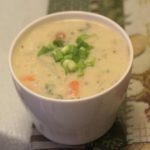 Put the soup mixture in the Refrigerator until the soup is cold. 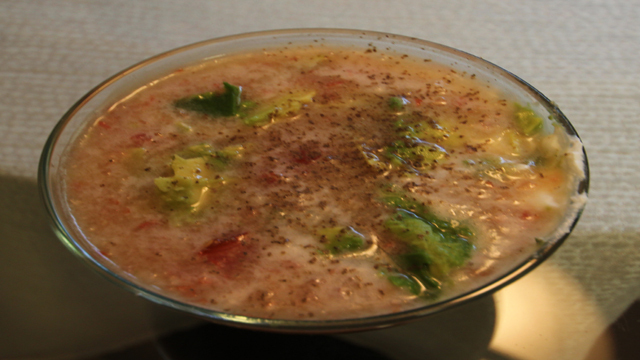 Place the Gazpacho Soup in a bowl and add chopped Tomato, Hass Avocado , and 1 1/2 tablespoons Sour Cream and serve.